There’s nothing quite like waking up to the sweet smell of fresh cinnamon buns baking in the oven. We do not recommend putting our Cinnamon Roll Macaw! Bars into the oven, but you’ll be just as satisfied when you bite into one. Don’t feel guilty if you polish off an entire ‘tray’. It happens. At one point or another, I think we’ve all been drawn out of bed on a Saturday morning to the tantalizing aroma of fresh baked cinnamon rolls permeating through the air. Centered on the breakfast table, these warm, gooey treats have been uniting families across America for decades. 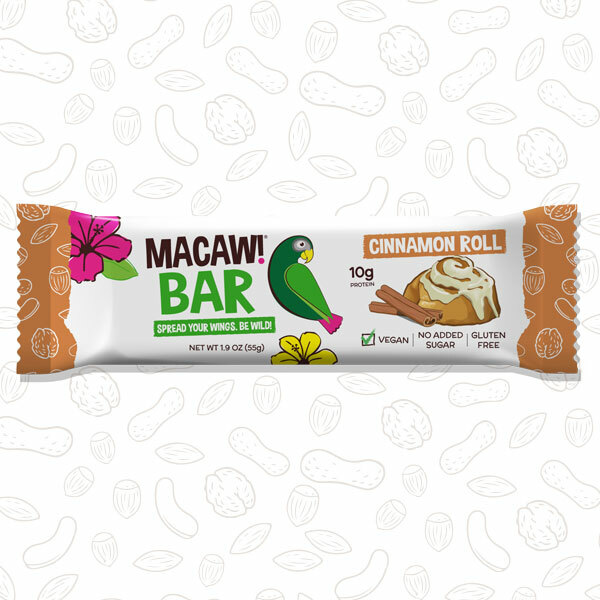 The humble reflection of this unique culinary experience can be found wrapped up inside the Cinnamon Roll Macaw! Bar. What used to be the fourth vegan flavor, using organic pea and brown rice flour, was instead converted into the fifth whey recipe, for the simple fact that it just tastes better that way. As you know, the top priorities for any member of the Macaw! Bar family, is taste and texture. No real crunch factor found in this one, but like Banana Bread and Chocolate Brownie, walnut pieces are generous. We find that walnuts just seem to work nicely when paired with specific ingredients. Cinnamon being one of them. In our best efforts to making you feel all warm and cozy, a handful of organic oats should do the trick. Oh, and if you’re new to the concept of putting chocolate in your cinnamon rolls, we assure you, taking a bite is worth the risk. 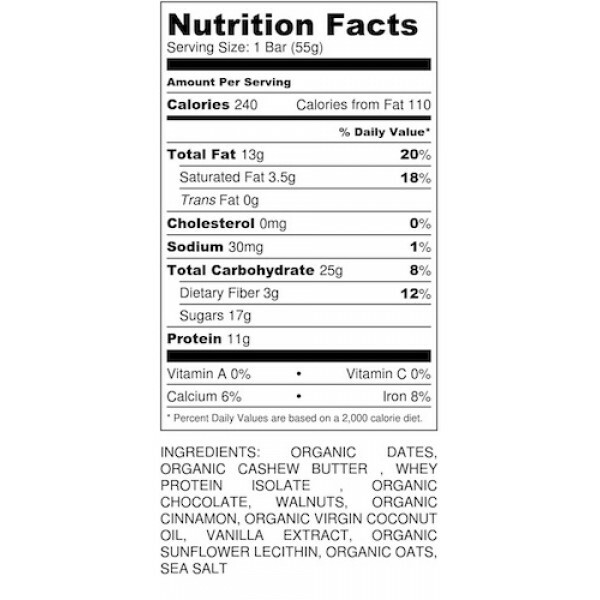 BASE: ORGANIC DATES, ORGANIC CASHEW BUTTER , WHEY PROTEIN ISOLATE, VANILLA, SEA SALT. 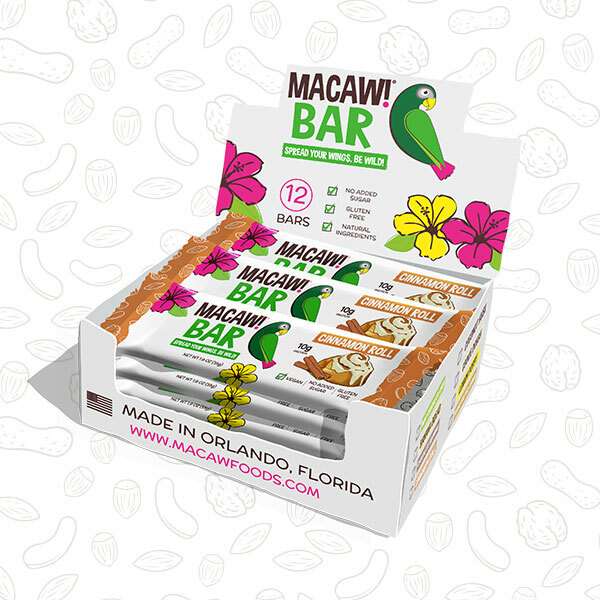 This is the same base we use for all of our non-vegan Macaw! Bars. We've spent over two years sourcing the highest quality ingredients, and formulating our 'base' so that it's the perfect combination of balanced nutrition, as well as exceptional taste and texture. Generous levels of cinnamon are what really bring out the flavor of this bar. The walnuts, dark chocoate, and oats really make the bar taste like a cinnamon roll. We use virgin coconut oil for it's health benefits and to improve the moisture levels. This ingredient has no flavor, but helps make every Macaw! Bar a chewy and moist consistency.